Congratulations for choosing Puerto Vallarta as location for your destination wedding!! 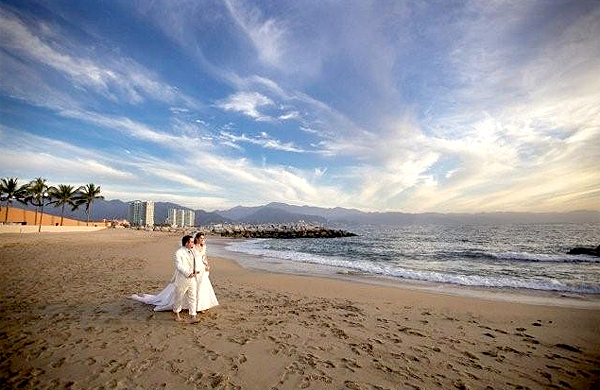 Puerto Vallarta is the premier destination for romantic, tropical weddings in Mexico. Rated by Modern Bride as the one of the most desirable destination wedding locations, so you are in the perfect place! Application for Wedding License (given in the correspondent public office for marriages or by your wedding planners) Application must be fully completed, with witness names and all spouse and family information. Photocopies of official ID of the couple, (passport or IFE Card). Death certificate of spouse, if applicable. If you are widowed, one full year must elapse from date of the death of previous spouse and a certified copy of spouse’s death certificate must be presented. Divorce papers, if applicable. If you are divorced, one full year must elapse from date of the divorce from the previous spouse, and the final dissolution of marriage must be verified with a certified copy of the divorce decree. A blood test must be taken once you arrive in Puerto Vallarta including a letter from a doctor certifying you are in good health. [These tests must be taken no more than 14 days before wedding date]. You need to arrive a couple of days before to Puerto Vallarta in order to take a Prenuptial Briefing – Every couple having a civil ceremony in Puerto Vallarta, must attend a prenuptial briefing before the wedding, where they shall be required to watch a short videotape about marriage. The briefing is mandatory to all couples. The Briefing takes place at the family services department of the municipal government and your wedding planner will give you schedules details. Two witnesses, age 18 or older. They can be either Mexican or foreign citizens, as long as they bring valid identification (passport or, in the case of Mexican citizen, IFE card) However, if the witnesses are foreign, they must bring the original as well as copies of their valid tourist card/visa. The parents of the couple may not serve as witnesses to the marriage. Birth certificates with apostilles*. Official copies of your birth certificates which have been apostilized by the Mexican consulate in your home country will first need to be sent to Puerto Vallarta to your wedding planner at least one month before your wedding date because they need to be translated by an authorized translator in Puerto Vallarta; You must also bring the originals with you to Mexico. Photocopies and originals of the couple’s valid tourist cards (FMTs)/visas and valid passports. If you do not have a passport, your apostilized birth certificate and a valid driver’s license [with photo] will be enough. Death certificate of spouse, if applicable, with apostille*. If you are widowed, one full year must elapse from date of the death of previous spouse and a certified copy of spouse’s death certificate must be presented. Divorce papers, if applicable, with apostille*. If you are divorced, one full year must elapse from date of the divorce from the previous spouse, and the final dissolution of marriage must be verified with a certified copy of the divorce decree. Two witnesses, age 18 or older. They can be either Mexican or foreign citizens, as long as they bring valid identification (passport or, in the case of Mexican citizen, ife card) However, if the witnesses are foreign, they must bring the original as well as copies of their valid tourist card/visa. The parents of the couple may not serve as witnesses to the marriage. Fulfilling these requirements (excepting the Apostille) will take you about 2 to 4 days. You will need to apply for the Apostille in your country of origin. This can be a lengthy process, so we recommend you start the Apostille procedure as early as possible. *All of these documents must have an apostille in order for the Civil Register Office to consider them valid and legal. The apostille must be acquired from the Secretary of State’s Office in the state where you were born. Canadians must have these documents certified at the Mexican Consulate’s Office in Canada. The marriage cannot be celebrated without fulfilling these requirements. Please note that these marriage requirements are for two foreign citizens. If one of the people to be married is a Mexican citizen, the process is lengthy and you will need to present your papers to the Instituto Nacional de Migración in advance. The foreign citizen must apply to request permission to marry the Mexican citizen, and if permission is granted, the wedding must take place within 30 days. Letter signed by both bride and groom, stating their intention to marry. Original and copy of identification of the Mexican citizen, accrediting his/her nationality as such.